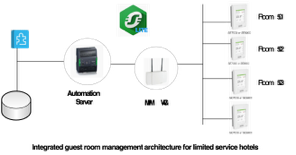 SmartStruxture Lite Guest Room Management System Overview. 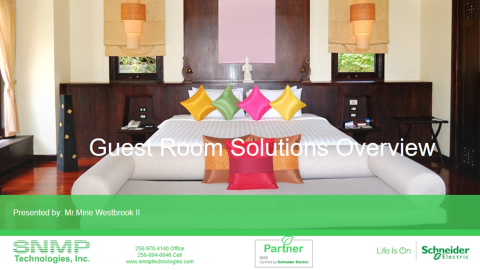 SNMP offers a range of guest room management solutions(GRMS) to suit a hotel needs, objectives, and budget. Whether you require a standalone guest room management solution for easy installation and fast ROI, a solution that integrates guest rooms with other Guest Room Management System (GRMS) and BMS/PMS, or one that provides advanced guest room functionality, comfort, and ambience. Our guest room management offers are designed to enhance the guest experience while driving energy and operational efficiency. This solution builds upon the occupancy-based Standalone solution to include integration with our GRMS. From this single-user interface, you can view and manage individual rooms, or the entire network of rooms, to drive energy efficiency, monitor alarms and events, and perform proactive maintenance. Take it one step further by integrating with PMS to activate rooms upon check-in, send personalized and promotional messages to guests, and set preferred language, temperature, and unit of measure on in-room devices. For full service and luxury hotels that want to provide the ultimate in-room experience for their guests. This solution builds upon the technology of the Standalone and Integrated solutions by adding a Hotel Room Controller (HRC) to each guest room. The HRC manages multiple lighting circuits, curtains, DND/MUR, bedside panel, and tablet applications in the guest room. It can also be integrated with the entertainment system to enable control from an in-room tablet or from your guests’ own devices. Our HRC builds a robust, added valued solution that ensures your guests enjoy a unique experience and pleasing ambience, enticing them to revisit your hotel in the future. The HRC aggregates data from all the subsystems and devices in the room, including the SE8000 and 3rd party systems like door lock. This is then served up to the GRMS and BMS/PMS for full visibility and control of the guest room, including occupied status, energy use, service requests, and maintenance needs. Standalone solutions pay for themselves and are most effective when we integrate the guestroom system with the hotel’s building management system (BMS) and property management system (PMS). The use of open standards allows both BMS and room controls to be integrated with a facility’s front desk and PMS. This provides hotels with centralized control of room comfort and promotes a building-wide approach to managing energy and guestroom comfort. Importantly, many controllers offer wireless communications capability, making them easy and non-disruptive to install in existing building. Networking and integration provide significant benefits. Deep set-back mode when room is unrented. Rented but unoccupied rooms can be set to adjust temperatures to save money, but this saving is limited because temperatures must be maintained within a certain range to ensure guest comfort. However, with networking and centralized control, a hotel can easily adjust unrented rooms to deep set-back or, in some cases, temporarily shut down rooms to eliminate unnecessary expenses. Deep set-back permits increased energy efficiency by reducing the set point in heating and cooling seasons. The ability to fine-tune these settings can significantly impact ROI and reduce the initial payback period. Since most hotels operate at a 70-80% occupancy rate, this means that 20-30% of rooms could be in deep set-back at any given time. A hotel could thus expect to reduce overall HVAC costs by many percentage points-potentially as much as 20% or more, depending on factors such as local climate, type of building, etc. Increased guest comfort for increased revenue Guest comfort is always the number one priority and directly affects hotel profitability. One study found that “if a hotel increases its review scores by 1 point on a 5-point scale… the hotel can increase its price by 11.2 percent and still maintain the same occupancy or market share”. Networked controllers improve guest comfort. Enabling the BMS to send an alarm if a room is out of a certain threshold when rented, allowing preventive maintenance before the guest complains. Providing the ability to change room parameters remotely to accommodate a guest or tweak a room that has been troublesome. Pre-cooling or pre-heating rooms that have just been rented to the “occupied” setpoint-instead of waiting until the guest enters the room. Greeting the guest in his/her own language on the thermostat (when integrated with the PMS). Identifying when a hotel or window has been left open for a long period of time, especially in rented but unoccupied rooms, so maintenance personnel can be dispatched to check up on things. These capabilities can significantly impact comfort and provide more positive hotel experience. Typically, hotel maintenance is in a reactive mode, repairing equipment when it breaks or responding to guest complaints. 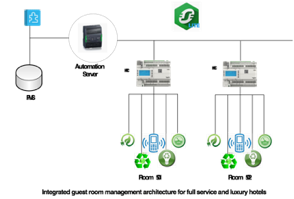 By networking guestroom controllers, a hotel enables its maintenance staff to be proactive. Problems often can be resolved remotely. Breakdowns can be prevented by recognizing performance problems and taking early action – at a lower cost than making emergency repairs and with less guest disruption. Continuous monitoring and electronic alerts result in higher guest satisfaction and improved maintenance response time when problems do arise. There are other advantages to networking, notably security. With occupancy and vacancy detection, the system is able to alert personnel if a room is occupied during unrented periods. This safeguards company property inside a room, and assures management that only authorized personnel are permitted to enter when the room is vacant. The GRMS provides centralized, holistic visibility and control of guest rooms, and integrates with other services like BMS, PMS and door lock. Hotel staff can easily view room conditions such as occupancy, energy use, temperature, humidity, and maintenance needs, along with HVAC, curtain, DND/MUR, door, and window status. Now you can manage individual rooms, or the entire network of rooms, to drive energy efficiency, monitor alarms and events, and perform proactive maintenance. This system can be wired or wireless functionally lowering installation cost, reducing downtime, and substantially accelerating the return on investment for typical retrofit projects however this is a new implementation and cost are even further reduced. Reinforced branding for the Fairfield Inn by displaying the hotel logo. Image or message on the screen. When integrated our BACnet® system, dynamic messages linked to events can be displayed on screen. The hotel can choose between five screen colors, two casing, and ten textured fascias to find the perfect combination to complement any décor. Out-of-the-box, multi-language support including English, French, Spanish, Chinese, and more. Onboard motion sensor delivers automatic energy savings based on room occupancy.